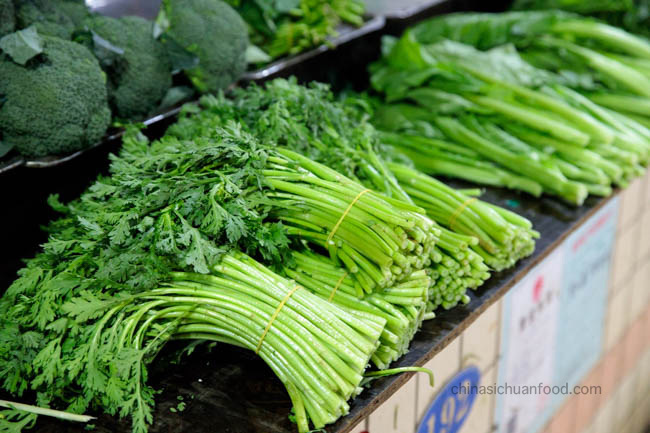 This is an ultimate guide of Chinese vegetables with pictures. 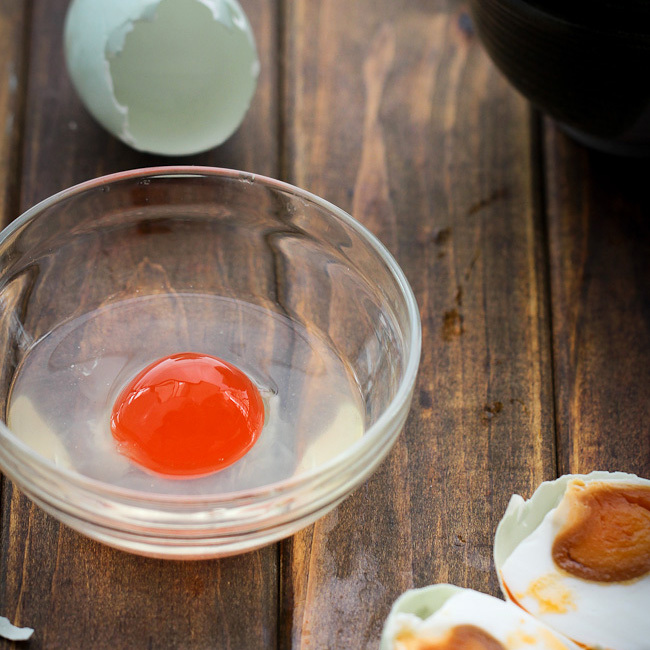 After writing so many recipes, I found that there are lots of ingredients unfamiliar to the blog readers. 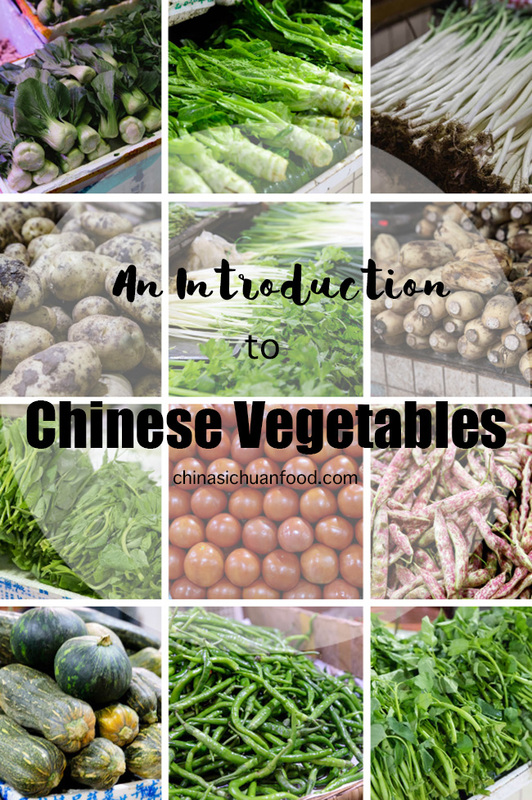 I hope this can help you to know more detailed information about Chinese vegetables. I will introduce the basic information, how they are used in Chinese cooking and how they look like. 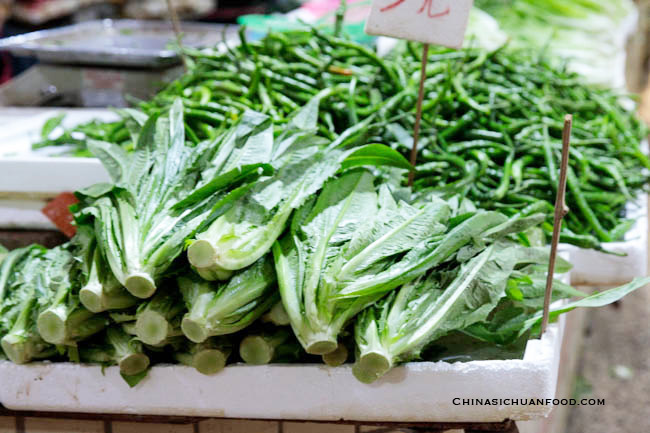 Bok Choy possibly is the most popular leafy vegetable outside and in China. This is a group name (小白菜) with several varieties. You may encounter with ones with white stem and normal ones with green stem. Besides, there are baby bok choy and regular bok choy. 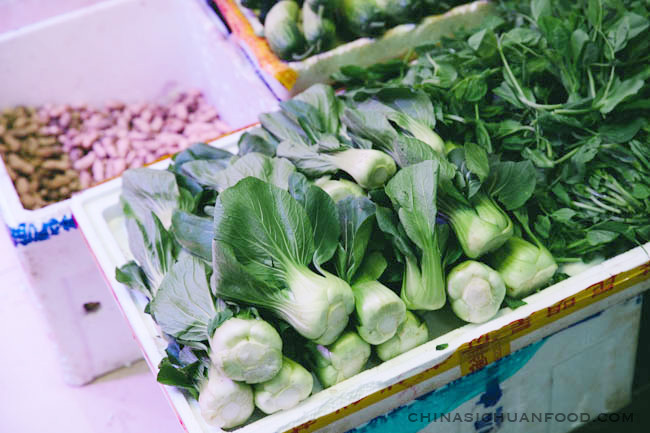 The green bok choy is known as “上(shàng)海(hǎi)青(qīng)”, while white bok choy is known as “奶(nǎi)白(bái)菜(cài)”.The whole piece is edible but you will need to separate each leaf to wash in order to remove the sand contained. The most common and classic cooking way of bok choy is stir frying with garlic. Besides, there are lots of soups and noodles calls for baby bok choy. Napa cabbage is named as ” 大(dà)白(bái)菜(cài)” in Chinese as a contrast to Bok Choy. They are usually with large stems and lightly green leaves. The Chinese cabbage was principally grown in the Yangtze River Delta region, but now it is extremely popular across the country. 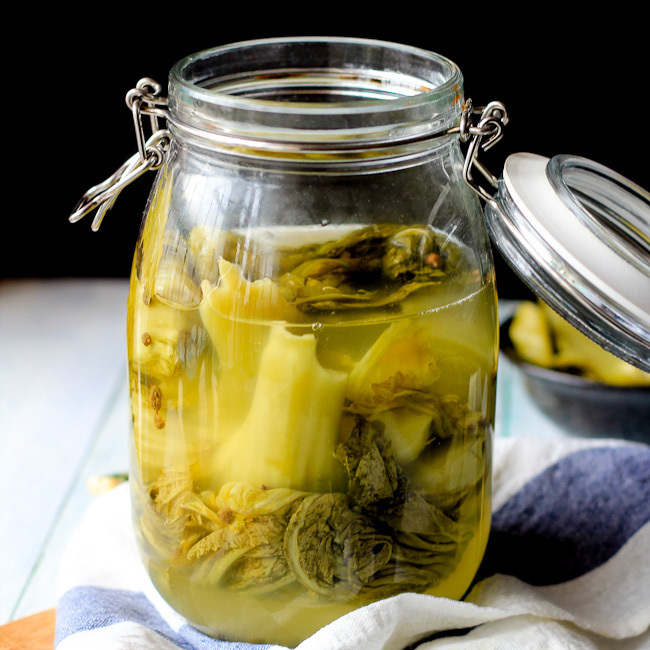 In Northern China, people love to use napa cabbage to make Suan cai in winter which has been developed into kimchi in Korean later. 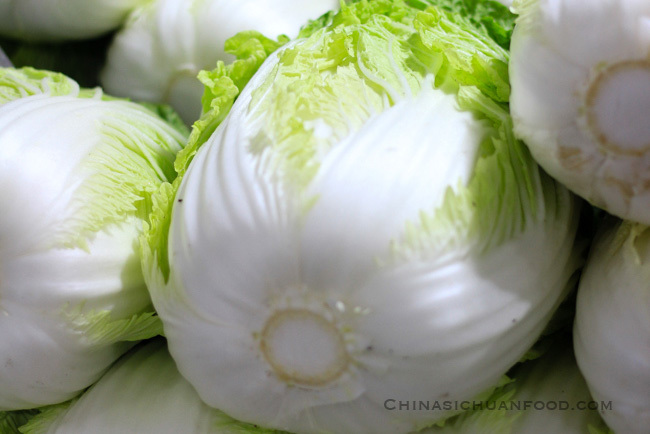 Good quality Napa cabbage usually is quite firm and may feel really heavy. Napa cabbage is the ingredient for kimchi . This vegetable goes extremely well with chow mein, lo mein or stir fried rice. 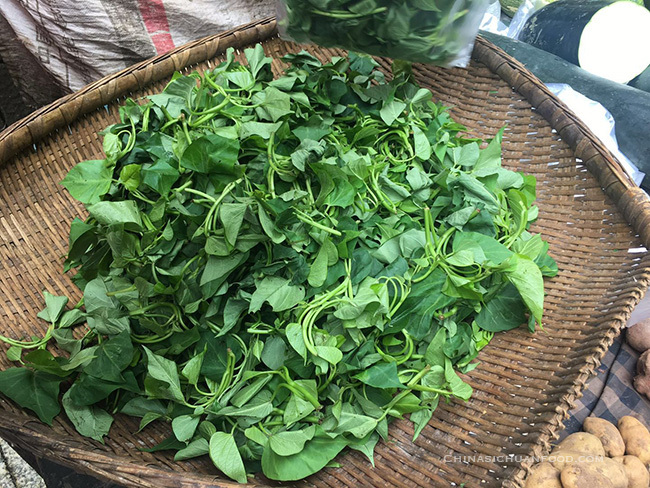 Water spinach also known as Chinese water spinach, rive spinach is the most popular leafy greens in hot summer days. It has long leaves and hollow stems so we name it “空(kōng)心(xīn)菜(cài)”, literally translated as hallow heart vegetable. It is grown in water or damp soil. The tender leave usually has a sweet and mild taste. Usually break the steam into 2 inch pieces along with the leaves. 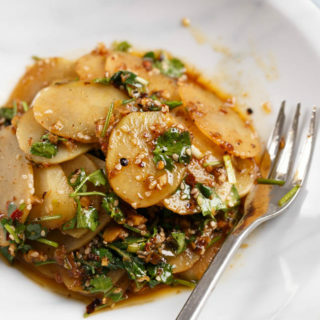 It can be used as a simple garlic stir fry or in stews and noodles. 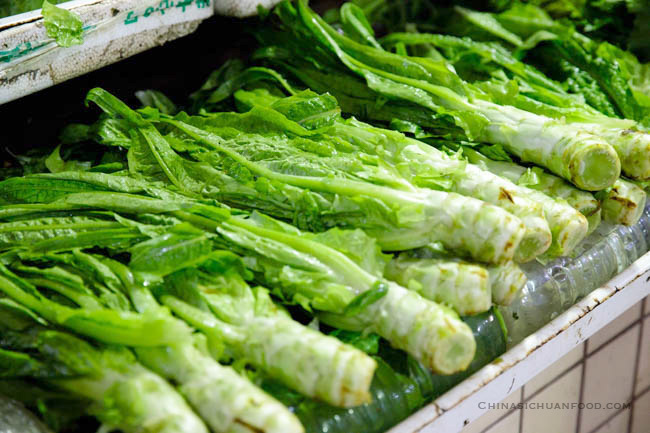 Yu Choy (菜心, Cantonese Vegetable hart)is also referred as Chinese oil vegetables or Cantonese Choy. 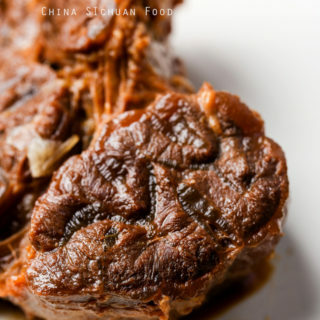 It is extremely popular in Cantonese cuisine. They have very tender stem (the best part of the vegetable in my opion), but you will need to peel off the skin. In other areas of China, vegetable hart may mean different plants. ). 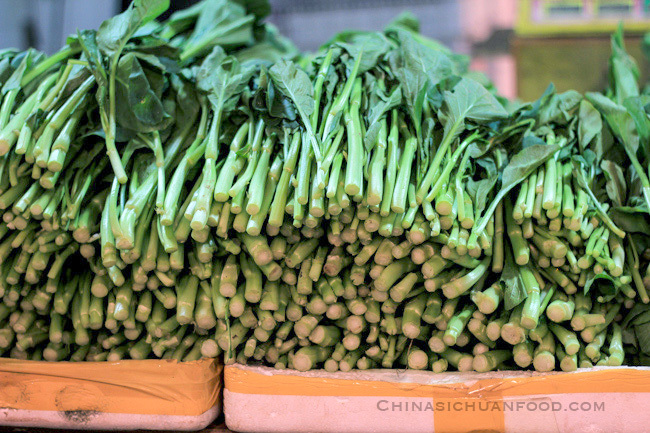 Chinese broccoli has long green stems and dark green leaves. It tastes slightly bitter so usually we rinse it in boiling water and stir fry with oyster sauce, which balance the taste with a slightly sweet. 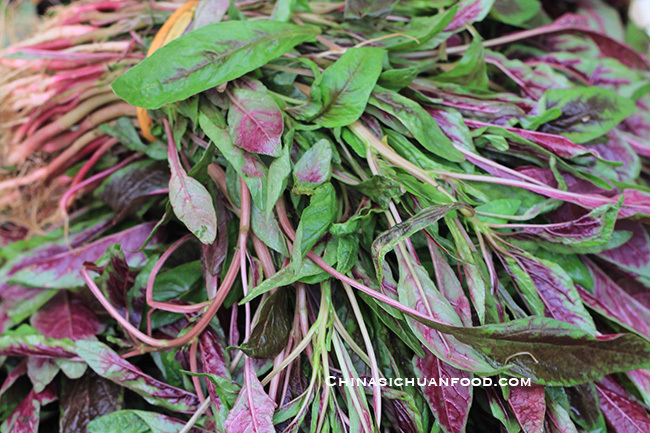 Malabar Spinach “木(mù)耳(ěr)菜(cài)” is a love or hate leafy vegetables in China. There are lots of people do not like it. We used to grow several vines in our back yard. And it grows quickly in summer. 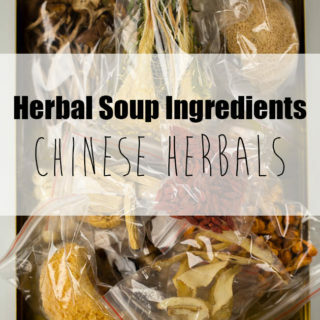 It can be simply used in stir fries or in soups. 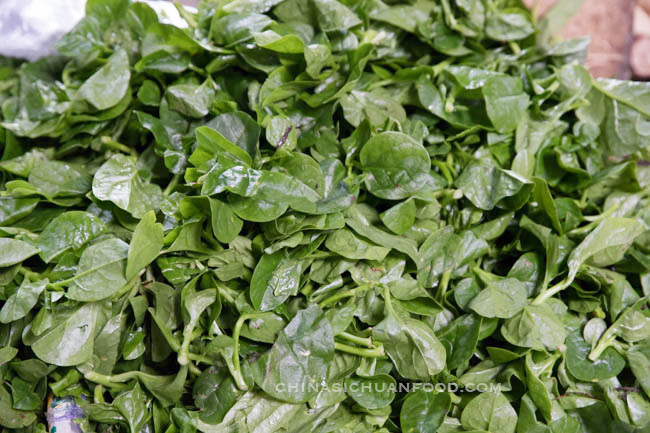 Chinese spinach|It is quite confusing when comes to the right English name. In Mandarin, we call it 莧菜: xiàncài. There are two main varieties: one is red and the other one is light green. Usually they contains lots of sands and need careful preparation. It tastes super good when simply stir fried with garlic and salt. Watercress is a fast-growing, aquatic or semi-aquatic, perennial plant native to Europe and Asia, and one of the oldest known leaf vegetables consumed by humans. Usually watercress has leaves in deep green and crisp stems. In Chinese, we call this type of leave veggie as西(xī)洋(yáng)菜(cài). 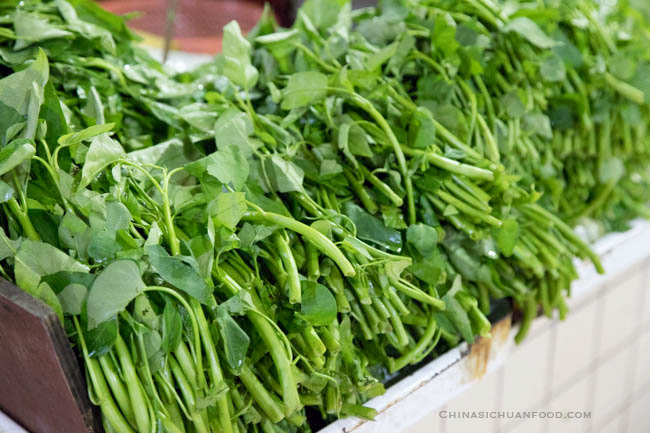 I usually prepare small bunch of watercress during hot pot dinner. 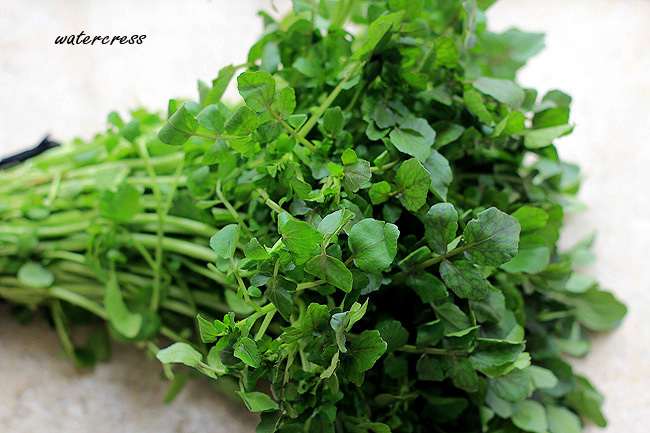 Watercress can be used in stir-fry recipe, soup recipe or salad. 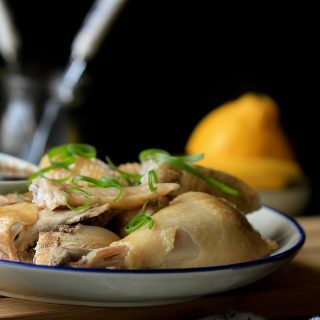 Besides, in the northern part of China, it is also used as the ingredients in dumpling or buns fillings. 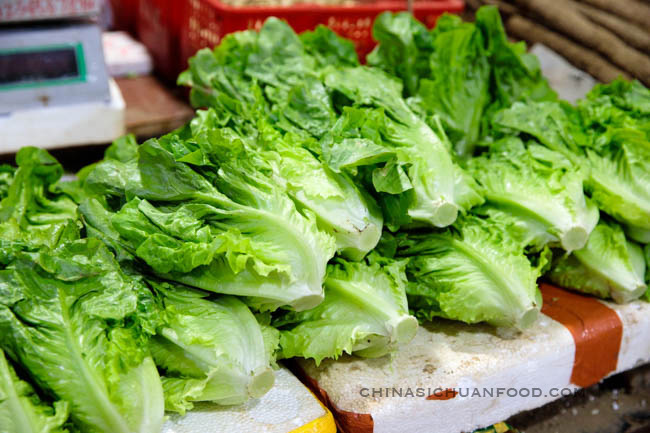 Romaine Lettuce | The most popular leafy lettuce in China is romaine lettuce. We did not eat it 10 years ago but now it becomes extremely in Chinese market. According to wiki, China has been the largest producing country. It is widely used as a simple stir fry with garlic or sometimes with oyster sauce, in salad or as a ingredient for hot pot. Wosun greens (Chinese Lettuce leaves) | Chinese Lettuce leave is names as Wosun leaves in China. Chinese lettuce is mainly grown for its stem. While the new trending is to eat the leaves as well, mainly used as a green vegetable stir fry. We have a variety grown mainly for the stem. 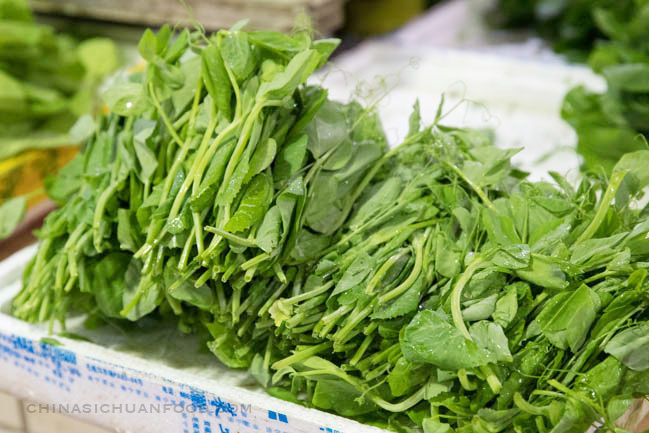 Youmai| This Youmai leaves are taste similar with Chinese lettuce leaves. 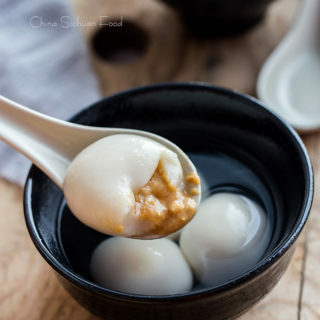 In China, we call it 油麦尖 (yóu mài jiān). It tastes similar to Chinese Wosun lettuce leaves. 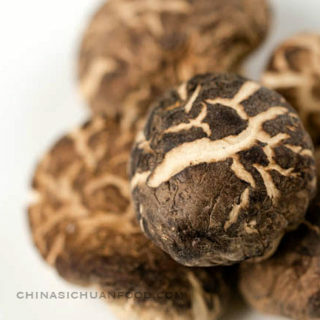 We love to stir it with garlic or cook in soups.It has soft and tender long green colors. I am not sure about the exact English name, perhaps it is Indian Lettuce? This species of lettuce grows quite fast in garden. Usually you can harvest tender leaves for soups, salad and stir fries 45 days after planting. Crowndaisy Chrysanthemum is another popular ingredients for soups and hot pot. The leaves have a mildly grassy taste while the stalks are slightly sweet and crunchy after cooked. Younger Chrysanthemum can be used to make a salad. We also stir fry chopped chrysanthemum with a small amount of starch water, which can help to soften the leaves and make flavors attached. Sweet potato leaves are harvested from younger leaves of the sweet potato vine. It is a very healthy dark leafy green. They are very cheap in China, we cook it at least 3 times each week in autumn when it is available. Only the top 5 leaves are good for stir fries. We usually fry the top younger leaves with garlic and cut the older ones and feed pigs. Thanks, Elaine! I’ve bookmarked this post for future reference. It will come in very handy next time I visit our local Asian supermarket. I am glad it might be helpful. I will continue complete it along with the seasonal changes on my local market. Good to know information, especially on how you use it. I love your recipes, thank you for sharing. Very bad chines green leaf. my local Chinese grocery store sells “Choi sam” year round which I presume is https://en.wikipedia.org/wiki/Choy_sum. Although wikipedia suggests a similarity to Chinese broccoli I didn’t notice the bitter taste you describe. Overall it is more like European winter spinach (ie quite tender down to the stems) but the taste differs and the leaves don’t wrinkle quite as fast when cooked. Do you know anything about this vegetable and if so, could you maybe add it to this page? Thanks for your suggestion, Andreas. I will add this group soon. I just cannot believe that you can get this outside China. 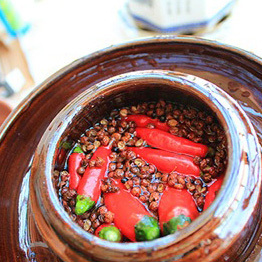 They are extremely popular in the following winter season in China. I love the purple one most. https://www.asiaexpressfood.nl/en/products/fresh-chinese-vegetables-import might give you an impression of what is and is not available at least in central Europe (the site is run by an import/wholesale business). Most of the stuff I buy here in Germany carries the label of some dutch import company. As you can tell by the little flags denoting their origin a lot of the fresh products are already produced either in the famous dutch greenhouses or in warmer regions of Europe. Thank you for giving information about healthy veggies and their importance. 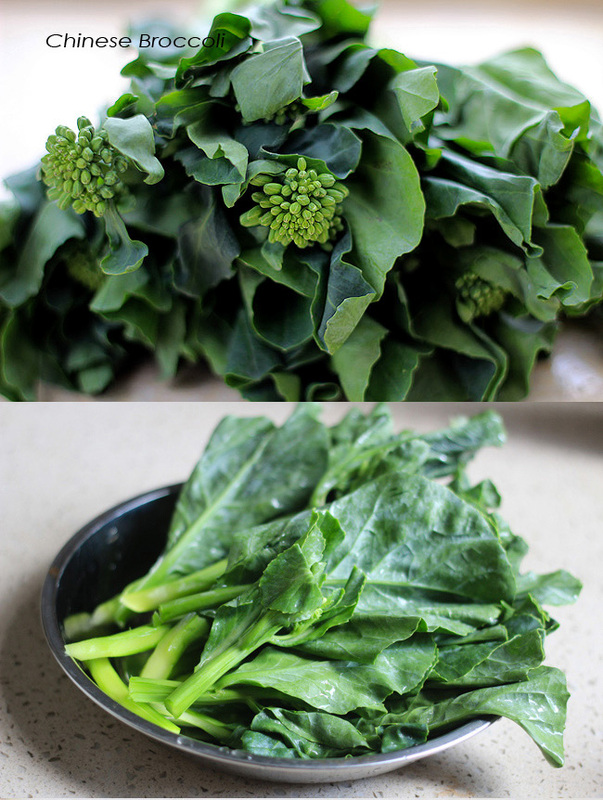 the Chinese store I get my groceries from is now selling something that is imported under the name “tatsoi”. Wikipedia suggests, that the (Mandarin) Chinese name is 塌棵菜. Do you know any recipes using this? In China, we use it as dark leafy vegetables. You can use it as a substitute of bok choy. I tried it with your “Bok choy with mushroom” recipe. I tasted really good. Actually, I think that “tatsoi” is a bit stronger in taste than bok choy and the next time I’ll try it with a recipe which adds less other flavors. I think I really like the plain taste of it. I’m very glad for your comprehensive information that help to get idea about Chinese leafy vegetables. further, i need to type of vegetable that could be cultivate and high demand for Chinese meals in restaurants in srilanka. also they are not exactly “leafy” greens I do have a question about the various onion or garlic- like greens I. I’m quite confused about them. Maybe you are able to help me. Now what is traditionally available here in Europe is leek (https://en.wikipedia.org/wiki/Leek) and chives (https://en.wikipedia.org/wiki/Chives). 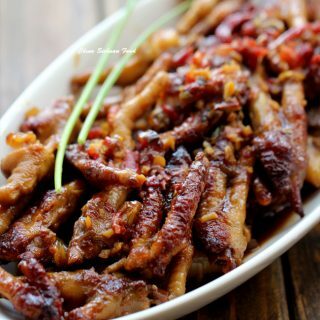 I have never seen those in Chinese recipes. For a couple of decades now spring onion is also very easy to get in regular supermarkets. I presume this is the same as scallions (https://en.wikipedia.org/wiki/Scallion). They come with white and purple stems. * Garlic Chives: https://en.wikipedia.org/wiki/Allium_tuberosum which are very thin. The translations are what the import company calls them. So which is used for what dish? Are the Garlic Chives correct for sprinkling over Mapo Tofu? Which one to use for soups? Or are they all used interchangeably? For the first two types | we have both of them planted in China but use it infrequently. Spring onion and scallion are two different species, but they can be used interchangeably. Our Supermarket usually provide either one of the two. Garlic chive is mainly used in stir fries or chopped and wrap in dumpling fillings. We use leek flower only for making sauces for Beijing style lamb hot pot. We cut garlic stem into small sections and use them in salad and stir fries. Those three are not interchangeably. The one we sprinkle on mapo tofu actually is garlic sprouts, the younger form of garlic stems. I will try to take some real pictures in our market. So thank you again for taking the time to explain this. It is a lovely suggestion. I will arrange this task soon. again this is not really a “leafy green” but I don’t know on which page to ask. The Chinese store I get my groceries from is selling fresh lily bulbs. They look just like little onions. Do you know a recipe using those? I really would like to know how they taste. We grow fresh lily bulbs ourself and they are believed to be super healthy food. It is seasonal now. It can be stir-fried with celeries or add in any soups with meats. I do not know it can be found outside China too. Will introduce this ingredient soon. I’d be delighted to see some recipes on your site using the Crowndaisy Chrysanthemum 茼蒿. I was just recently looking for it to make some Japanese nabemono and found out that it’s quite easily available in the Vietnamese grocery stores around here. As I think its taste is quite unique and delicious I’m eager to know more recipes using it.